Though the jury is still out on the exact origins of pizza, Italy has certainly taken the title of making the pizza one of the best-loved dishes in the world. Italy alone consumes around 56 million pizzas a week. But as with any national dish, the exact recipe and form varies from region to region and rarely gets translated once it leaves its home country. So here is a slice by slice guide to Italy’s regional pizzas. It’s only right that we begin our journey in the city that created the pizza we all know and love, with its iconic red (tomato), white (mozzarella) and green (basil) topping. In 1889, Neapolitan chef Raffael Esposito dressed his pizza to match the flag of a newly independent Italy and thus the Neapolitan was born. The origins of the tricolour-topped round flatbread are so well protected that only tomatoes grown in the volcanic soil of Mount Vesuvius, and locally sourced buffalo mozzarella can be used to create a truly authentic Neapolitan pizza. Arguably the home of Italy’s most ancient pizza recipes, the Ancient Romans used to feed it to the gods. Unlike in Naples, Roman pizza is all about the way it is served rather than what goes on top. For example, “pizza al taglio”, means “by the cut” and is baked in large sheet pans then sold by the slice. You pay for its weight and order as many different slices as you like. The round version of pizza romana has a super thin crust so it’s easier to cut. A popular topping for Roman pizza is to skip the tomatoes and serve it blanca (white) – sometimes with just a little salt, oil and rosemary. In Italy’s northern region of Liguria, pizza toppings get a lot more creative. It is not uncommon to find variations where the tomatoes are swapped for green pesto – a sauce native to Liguria – and the base itself made focaccia style which is light and fluffy. 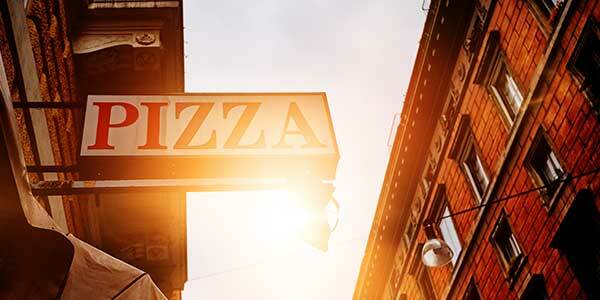 The country’s fashion capital has always liked to do things differently and pizza is no exception. Here, the local way is to fold the dough in, stuff it with fillings and then fry it. Referred to as the panzerotti, it is most comparable to the better known calzone, often found here in the UK. Down on the island off the tip of Italy’s boot, Sicilians like their pizzas thick and doughy. A particular favourite is the scacciata, which is most likely where the North American ‘pizza pie’ came from. The toppings become fillings as the thick dough gets stuffed full of ingredients like cheese, broccoli and spicy sausage; then baked until golden brown.